Ready for a summer cookout? I highly recommend giving this Tsukune recipe a try. 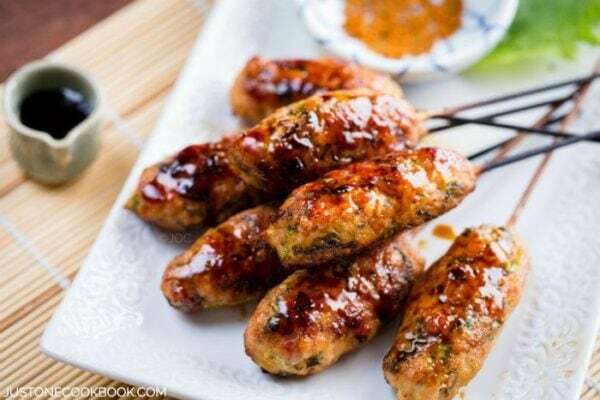 Drizzled with sweet soy sauce, these Japanese chicken meatball skewers are absolutely delicious. They are best on the grill but you can bake them in the oven too. Tsukune (つくね) is Japanese chicken meatballs that are skewered and typically grilled over charcoal served in yakitori restaurants. Since I had received great feedback from readers on my oven-broiled yakitori recipe, I couldn’t wait to share this tsukune recipe! As summer is just around the corner, I highly recommend to bring these skewers out to outdoor grill and enjoy! Tender ground chicken skewers with bits of shiso leaves and scallions, drizzled with sweet soy sauce. 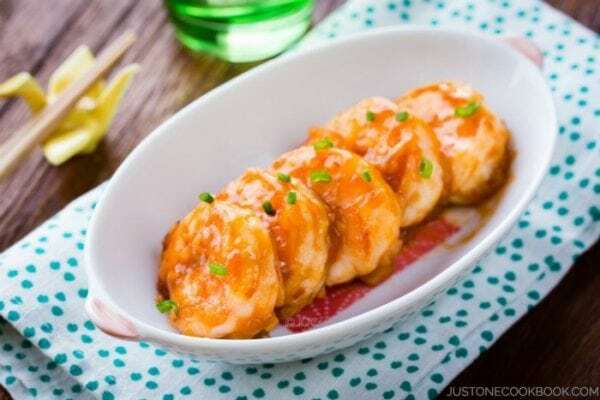 Make them in an oven or on the grill! Tsukune is usually seasoned with salt or sweet soy sauce – yakitori “tare”. 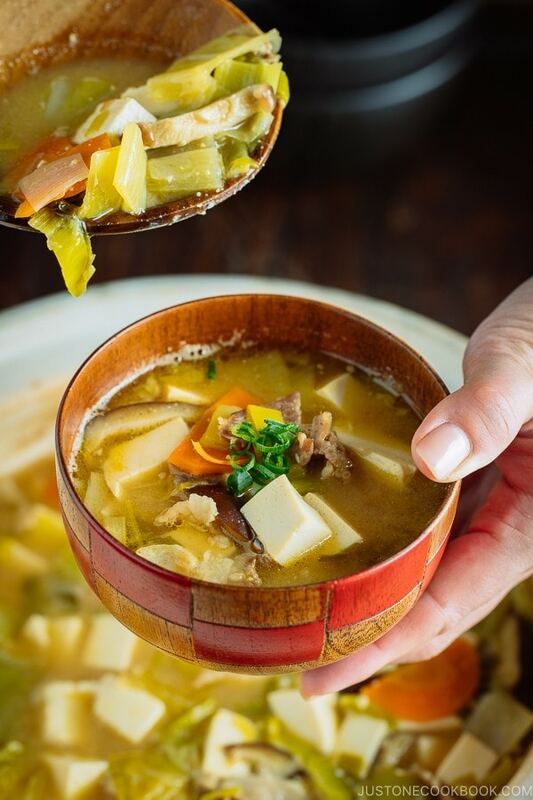 Ingredients for “tare” are similar to teriyaki sauce, but “tare” is much thicker and saltier. When the yakitori “tare” gets caramelized under the broiler (or over the grill), the tsukune becomes incredibly delicious. Slightly charred soft ground chicken with bits of shiso leaves and scallions and drizzled with tare…it’s hard to stop eating just one. Usually tsukune recipes require eggs or panko to bind the ground meat together so that the meat won’t easily fall apart. However, I learned this trick from my mom to knead the chicken mixture until it becomes pale and sticky. The meat never falls off from the skewers and this method really works! When you make chicken meatballs, you want to make sure they are fluffy, springy, and juicy. I learned this great technique from The Japanese Grill, one of Mr. JOC’s favorite grill cookbooks, and I’ve been following this method ever since. 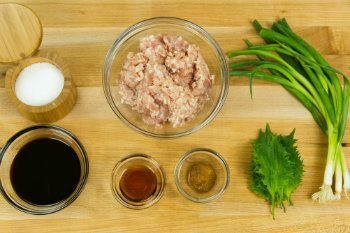 With this method, you precook some of the ground chicken first, let it cool, and mix it in with the raw ground chicken instead of making meatballs from all raw ground chicken. This prevents the meat from shrinking too much. Sometimes when you grill meat you end up with much smaller pieces because the meat shrank after cooking. Also, this prevents the meat from losing a lots of juice. Although it an extra step, I find it’s totally worth it! Also, if you can’t find shiso leaves, it’s fine to omit but definitely tastes better with it. 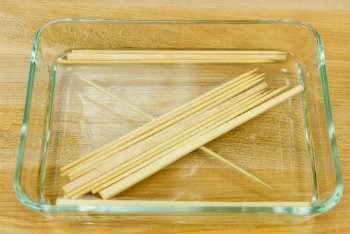 Soak the bamboo skewers in water for 30 minutes. Pile and roll up the shiso leaves, then cut into thin julienne slices. Cut the scallion into thin slices. Heat a non-stick frying pan over medium heat. 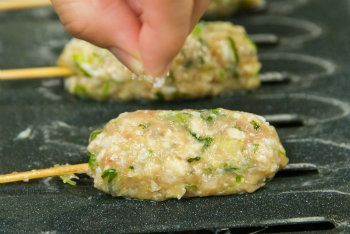 When it’s hot, add ⅓ of ground chicken and break it up into small pieces using a wooden spatula. Cook until no longer pink and transfer to a plate to let it cool. Combine the cooked chicken and uncooked chicken in a large bowl and mix well with rubber spatula. Add sesame oil and miso and mix well. Add the scallions and shiso leaves and combine well with silicone spatula. Now with your hand, knead 30 times clockwise. Then knead counterclockwise 30 times. The meat will become more pale in color and sticky. This part is very important for the meat to stay on stick so please do not skip this step. 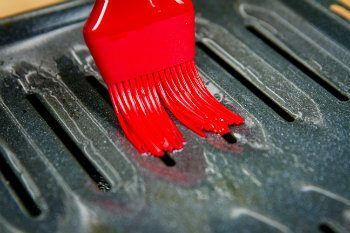 Grease the grill rack with brush. I use a roasting pan and rack as it can support the skewers very well while the excess oil drips down to the bottom of roasting pan when cooking. 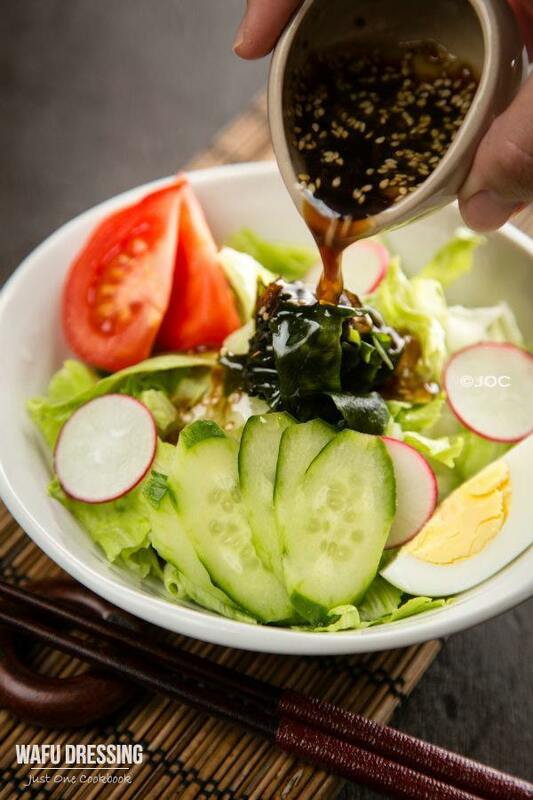 Lightly coat your hands with sesame oil to prevent the meat from sticking. Scoop a handful of the chicken mixture (1 ½ scoop for my hand using an OXO cookie scoop) and form into a round patty. Toss the meat to left and right hands to release the air pockets and gently squeeze to form the meat into a long oval patty, about 3-4 inches in length. Insert the skewer on the prepared wire rack. Lightly sprinkle salt over the chicken skewers. Put aluminum foil around the skewers to prevent them from burning. Preheat the oven to High Broil (550F) for 5 minutes. Boil in the middle rack, for 6 minutes. Then flip the skewers over and broil more for 4 minutes. When both sides are cooked, brush the yakitori sauce on the meat and broil for another 30 seconds. Transfer the skewers to a serving plate and brush the extra sauce on the meat. 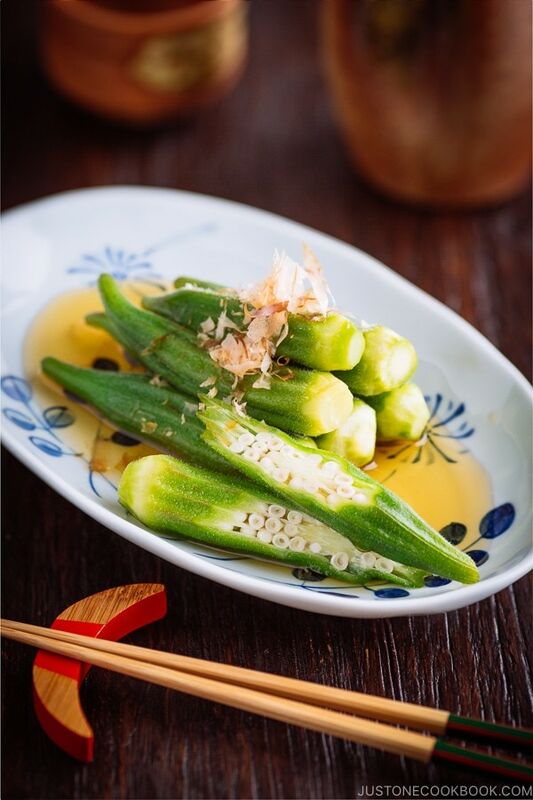 Serve with Shichimi Togarashi. Yakitori Tare: Homemade recipe, click here. In France, tsukune might be one of the most loved dish at Japanese restaurant, I was surprised not to find it here in Japanese restaurant (but well… they also serve beef and cheese skewers in France, so…). Are they always made in this shape ? I’m doing your recipe tonight for dinner. 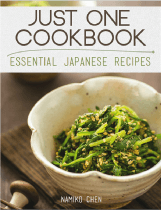 I, however, don’t have shiso on hand so I will have to do without. 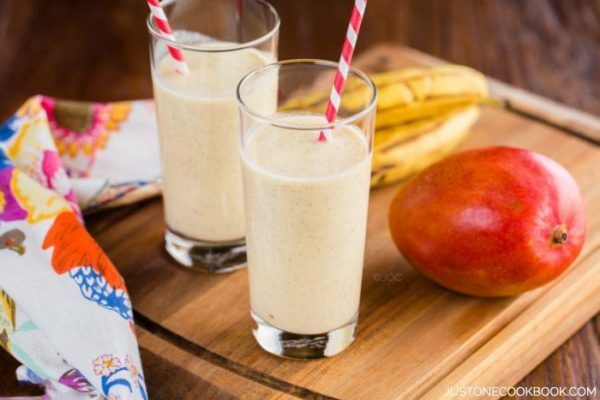 Thanks for the recipe and most especially, for the tip to eliminate shrinking. Another organized presentation. Superb! Incredibly delicious, and pictures speak for them self! Great recipe and video. You never disappoint!!!! I love how you wrapped the wooden skewers in foil! These remind me of Persian kabobs, but of course much different flavors. Interesting that you mix cooked chicken with uncooked. I’ve never seen that done before. Combining cooked with uncooked chicken to form the meatballs is a very unique technique. The skewers themselves look very tasty, of course. Really interesting technique to cook some of the meat, then mix it with the uncooked. I’ll have to try that! Great recipe — so much flavor. And I can never resist a meat ball. Or anything on a skewer. 😉 Thanks. 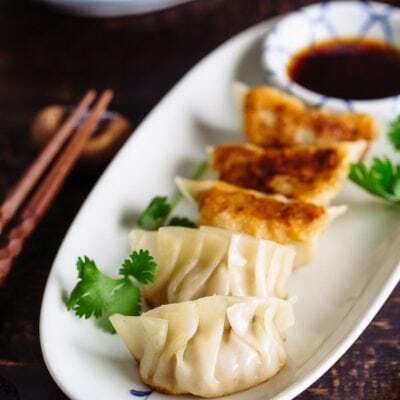 These look so delicious, Nami! I love the glistening golden colour of them. It’s bedtime but now I’m hungry 🙁 I also love the trick of using some precooked meat mixed in, quite genius! 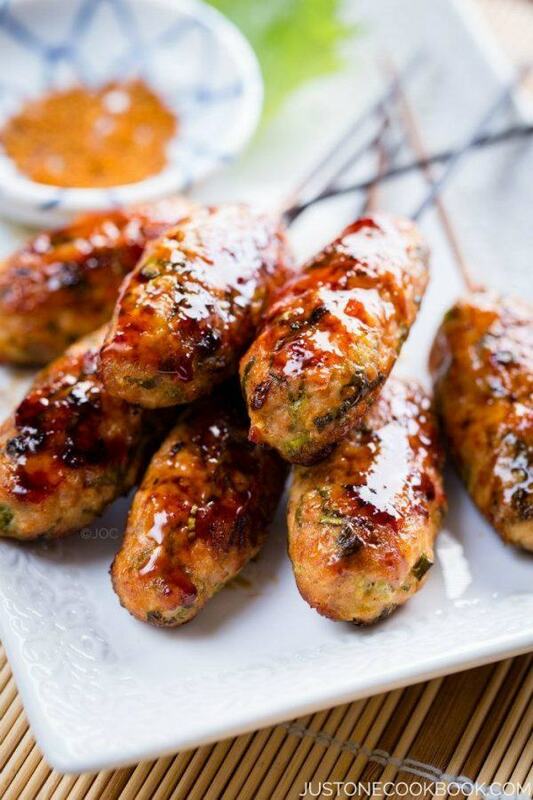 We are fond of Yakitori and tsukune in France! I usually cook them but without shiso leaves. I will try tsukune with them and taste your way. Count me in Nami! 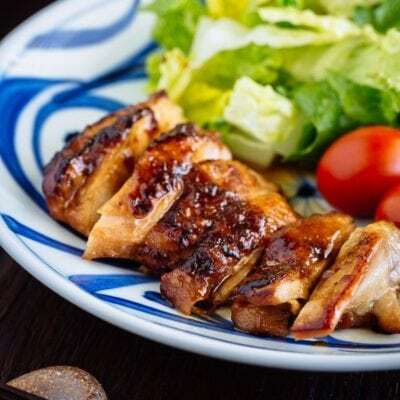 They look perfect to me and since I love teriyaki I am sure I will love tare too! I love yaks tori and this looks so delicious as I’ve never tried tsukune!! Looks simple too! Those meatballs look ever so good and tasty! A wonderful dish. This looks insanely good! I love all your videos. Doing a fantastic job with that. I am a visual person so it helps. We don’t get pre-ground chicken here… is it pure thigh or is it breast meat? A mixture of both? i really truly am drooling over this and trying to figure out when to make it soon! It looks delicious and sweet and salty and tender and I love it! I have the same grill rack in my kitchen, but I never used it…cna you imagine? Now I know that it’s useful. What a delicious recipe. I’ve had this before at restaurants. But now that you shared the recipe I must try it at home. My family will love it. Thanks for the great step by step photos and video to explain it further. Have a good week, Nami! These sound just delicious! I’ve never had tsukune before, so I absolutely want to try it out soon. I bet this mixture would be great formed into meatballs too! This sauce sounds delicious and I am sure these would be great on the grill. 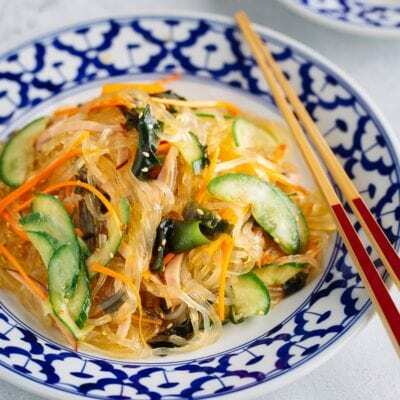 We’ll definitely try these this summer Nami! Love your mom’s kneading tip. Thank you for sharing. 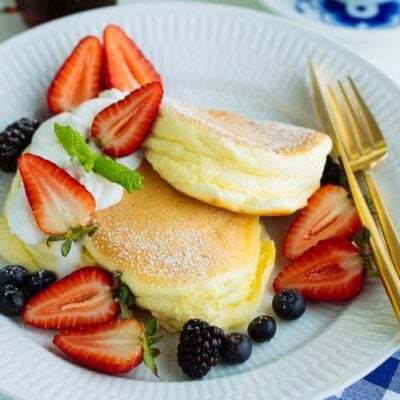 These look very delicious – another food I’ve seen often and I now know how to make! Thanks for sharing the trick of precooking some of the ground chicken first. It certainly makes sense, but something I would never have considered. I’ve seen meatballs cooked this way a few times but have never done it myself. Thanks for the recipe! Nami – these look so fun, perfect for summertime grilling. Love that trick of mixing some cooked + raw ground chicken – so interesting. Actually, tsukune is my favourite item on the menu when I go to Tokyo’s yakitori bars (together with the rare chicken breast, but it’s not available everywhere and I wouldn’t have it just anywhere). 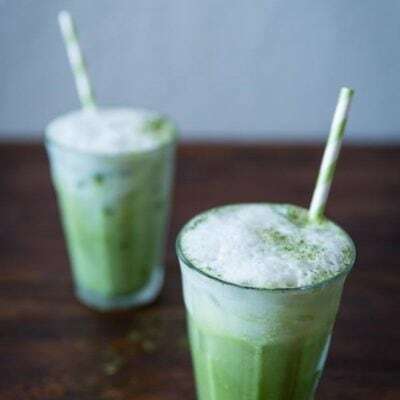 I remember I once went to a bar, where tsukune wasn’t on the – shortened – English menu; I wanted to taste it so much, I finally asked “do you have tsukune?” and it was the first question I dared asking in a bar in Japan 🙂 . Actually, they did have tsukune and it was extraordinary. Omg! These look so delicious! I bet the flavor in these is insane! I love your method of cooking Tsukune in the oven. Who would thought of that? I don’t have the outside grill at home right now, so this is great to know that I can cook this way. I do Steak the same way. By the way, do you grow your own Shiso in your garden? OMG I’m dying to bite into one of those! Absolutely mouth-watering! These look so flavorful!! Never heard of this recipe but will try soon! Hi Albert! So nice! I don’t think I’ve been to a restaurant that only specializes in tsukune before! I think I had seen tsukune before but can’t remember where. They look lip smacking good Nami. Great cooking tip btw, need to try this soon! The use of both cooked and uncooked chicken at the same time is quite new to me and I would have thought the cooked part of the meat would add dryness to the finished dish – obviously not! Looks very much worth trying!! 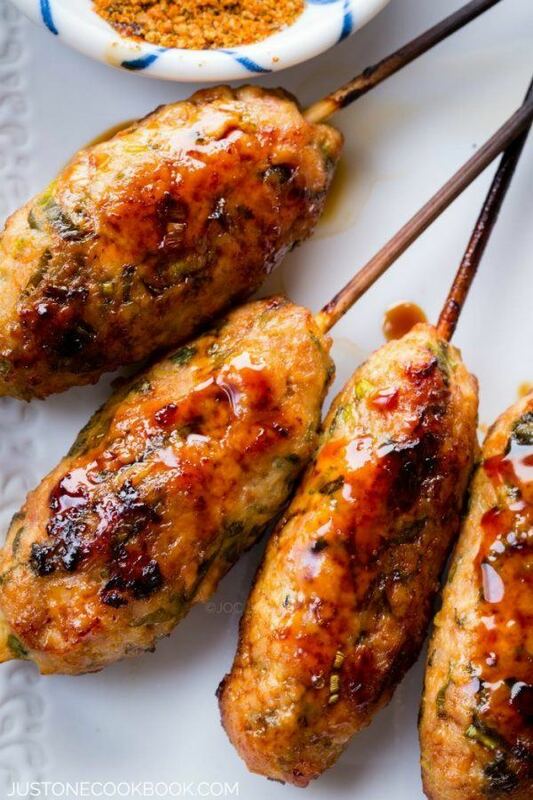 Personally I do not use foil at the end of the skewers – just place them in water for half an hour before placing the ‘sausages’ on them [yes, I make most Eastern minced meat dishes in that shape 🙂 ! 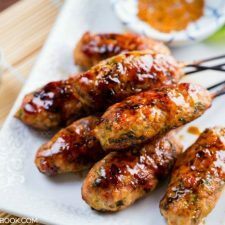 Dear Nami, as some of the other commentators, I am also taken by the fact that you combine raw as well as cooked ground meat in this recipe – it does make sense if you want to have your final skewers keep their pretty shape after baking in the oven. Also, to wrap the wooden skewers with foil is a wonderful idea to keep them from turning too dark – these are all wonderful tips and and an outstanding recipe. And I like the third picture the best where you can marvel at the delicious, shiny sauce on your Japanese chicken meatballs. These are in the oven now. And my kitchen smells divine! I’ll let you know how they turn out. Some hard to find ingredients in Canada, even in local Asian grocery stores. Shiso leaves-any substitute? Great blog still! 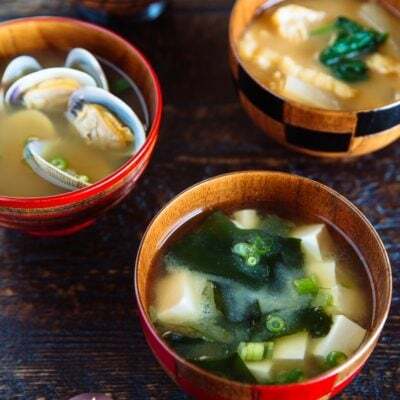 What type of miso do you use (white)? delicious! i didn’t have any shiso but found out mint was a good substitute for it so i used that instead. it was amazing! i was too excited and didn’t realize i had to boil down the tare (oops), but it still tastes great. luckily i saved the tare mix so i can easily boil it down next time. ha ha. I can’t wait to try this out this weekend! Do you think it will be ok to pre-make the skewers and refrigerate for overnight then cook just before serving? Also, how does the homemade tare sauce compare taste-wise to a store-bought terriyaki sauce? It sounds like it might be milder in flavor? You’re the best. Thanks for the advice! 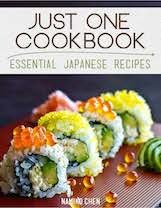 I really want to try this recipe but I always thought that I could not mix cooked meat with raw meat. This method prevents the meat from shrinking too much. Sometimes when you grill meat you end up with much smaller pieces because the meat shrank after cooking. Also, this prevents the meat from losing a lots of juice. I made this recipe last week and it turned out great! I want to make it again a day before for a party and just heat it up right before serving–would that be ok? If so, would it make sense to brush on the sauce at that time too or doesn’t make a difference? What type of ground chicken should I use so that it won’t be so hard after I grill it? I tried some before and it was really dry. I bought a packet at the market and I think I must have picked the one with more lean% . Which one did you use here or did you make your own? Thank you! This was good, but came out rather dry. Any suggestions to make it more moist? Also I prepared the tare according to your recipe, but 1) it never really thickened and 2) tasted very strongly of sake and shoyu. Any suggestions? Hi Debbie! Thank you for trying this recipe! Did you use broil? If you use “bake” option and cook for a longer time, it’s possible it gets dried out. Also it depends on the fat content of the ground chicken. I got mine from Japanese supermarket and I think it has good amount of fat in it. About tare, did you uncover to reduce the tare? Since you mentioned that it never reduced, I was wondering if you cover with the lid. It should be reduced because the liquid evaporate. Since yours didn’t evaporate, I think the sake smell was strong. Tare is rather on salty side as it’s meant to brush on the chicken (not to dip in etc). Hi Shirley! Maybe your portion is too heavy/big for your skewer. Try reducing it a little bit. 🙂 Hope this helps! Hi Nami, It is hard to find fresh shiso leaves. What is a good substitute for shiso leaves? I made tsukune without shiso leaves and they were good but just missing a little something. Thanks. I didn’t have al the good ingredients and my yakitori sauce was far too heavy and too salted (bought from a shop), but the texture of the tsukune was almost there. The idea of precooking a part of the chicken is simply great. Even too salted,, the result is way better than what i got in my preceding attempts. I think that what is missing in your recipe would be to put the preparation in the fridge for a while, so that the balls will be easyer to form when the mixture is colder. Also they would cook better outside and stay more juicy inside. I also put tiny breadcrumbs outside,,and i had nothing to complain about that. Next time my tsukune will be perfect. Hi Marc! Thank you so much for your detailed feedback and tips! As I use a broiler for the recipe, make sure the mixture doesn’t get too cold. It takes longer to cook inside while the outside will get cook too fast (so inside will be raw). Maybe keep it out at room temp before putting in a broiler might help. Hope your next one will go well! Thank you for writing! what differences : it took me time to find shisho leaves, and i found leaves that look exactly like yours execpt that they are green on one side and purple on the other side. I didnt like the taste of these leaves so i simply decided not to add them. i also forgot to buy miso, so i replaced it by a hot condiment and ginger. I like them. the textture was much better the first time when i cooked them with a very little sauce in a pan, because it was much more easy to stop the cooking wen done. Mty tsukune was rather large so for sure, 6 minuts on one side and 4 on the other side at this temperature is far too much. thankd for this. Anyway i know what to do the next time. Now i did it almost by the book. What differences : it took me time to find shisho leaves. I found leaves that looked exactly like yours except that they are green on one side, and purple on the other side. I didnt like their taste, so i simply decided not to add them. i also forgot to buy miso, so i replaced it by a hot condiment and ginger. IT doesnt taste like miso, but i like hot dishes. I made myself a yakitori sauce but i changed the proportions by adding much less soy sauce, and i did well because it would have been far too salted for me. The tare was perfect. I used agave syrup instead of sugar, because i have diabetes. When it got caramelized, i added some sake to reach the texture that i wanted. then i placed my tsukune above the middle of the oven like in your video at high broiler temperature,. and i must tell you that 6 minutes on one side and 4 minutes on the other side is far too much ! They didnt burn, but they dried. I was fearing that it would happen, but i wanted to reproduce your recipe as much as i could. the texture was much better the first time when i cooked them with a very little oil in a pan, because it was much more easy to stop the cooking wen done. My tsukune was rather large so for sure, 6 minutes on one side and 4 on the other side at this temperature is far too much. Unless the temperature of your oven is lower than you think ( it is unlikely, because the oven of your video seems to be very nice). thanks for this. Anyway i know what to do the next time. 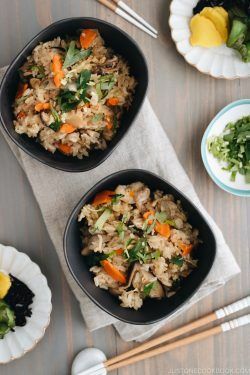 I cooked these over the weekend and my fussy kids loved them. They left 3 for my husband and I.
I subsituted shiso leaves with 1 tsp of cinnamon and 1 tsp of clove powder. And substituted mirin for chinese rice wine with 1/2 tsp of organic palm sugar. 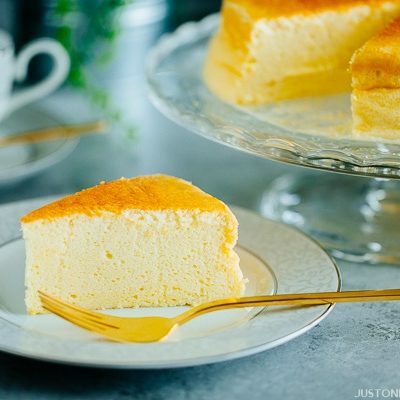 It was still fantastic and I am going to add this recipe to our regular list. It was easy too! Some issue sI found, even after needing for so long the mixture was too wet to put on skewers. It was the sesame oil..So I just cooked in a log shape and inserted the skewers after they were cooked! It was still very moist though. . THANKS SO MUCH, LOVE IT! I made tsukune for dinner tonight and it was a huge hit. I made a few adjustments. I couldn’t find awase miso but bought Hikari brand red miso instead as I read it’s better for meat. Didn’t use shiso as they are hard to locate. Had to use some white wine as I didn’t have any sake on hand for the homemade yakitori tare. Despite the adjustments & substitutions and the fact that the recipe was a lengthy one, we were rewarded with tender, juicy and flavourful chicken meatballs. I didn’t even need to use any Shichimi Togarashi. Thank you Nami for the great recipe with many precise instructions. 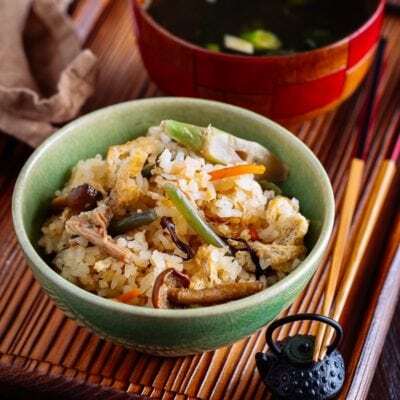 From this recipe I learned how to cook ground chicken, how to prevent shrinkage and losing juice by mixing cooled cooked portion of ground chicken with raw portions and how to bind the ground chicken together without eggs or panko. Oh I also get to learn to make homemade yakitori tare. Will the technique of mixing cooked ground meat with raw ground meat work for pork or beef? Hi Christina! 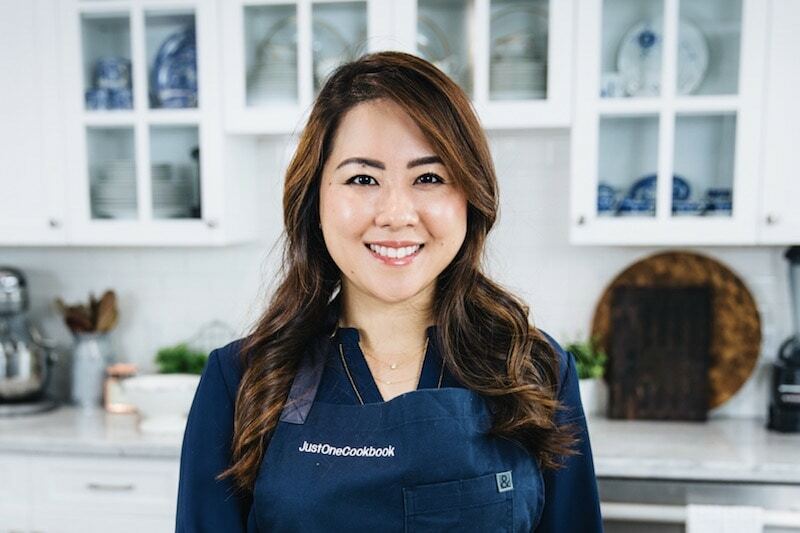 Thank you for trying my Tsukune recipe and sharing your feedback! It’s very helpful for other readers. I’m glad you enjoyed this recipe. Thank you Nami for the reply and the tip on making the hambagu. If I ever try the chicken meatball using beef or pork, I will be sure to report back. By the way, is it possible to make the chicken meatballs in ball shape (instead of the sausage/oval shape as in your photo) and follow the rest of your recipe? I’m thinking the long oval shape fits perfectly on the roasting rack & the excess oil can have a space to drip down into the pan. Have you tried the ball shape with the roasting rack & pan? Ah that makes sense. Using different shapes to distinguish various skewered items. Thanks. Perfect tsukune recipe, I enjoyed it very much! Thank you!